Axolotl (or ajolote) is the common name for the salamander Ambystoma mexicanum, which is the best-known of the Mexican neotenic mole salamanders belonging to the Tiger Salamander complex. Larvae of this species fail to undergo metamorphosis to a terrestrial form, so the reproductively mature adults do not lose their larval characteristics, remaining aquatic with external gills. (There are exceptional circumstances when metamorphosis can be induced.) The species originates from the lake underlying Mexico City. Although the axolotl is limited in distribution to just one small area of the world, it is well-known. It uniqueness adds to the human wonder of nature and axolotls are used extensively in scientific research into such areas as regeneration ability, heart defects, and vertebral development. Their ability to regenerate most body parts, ease of breeding, and large embryos are main reasons for their applicability as a model organism for research. Axolotls commonly are kept as pets in the United States, Great Britain (under the spelling Axlotl), Australia, Japan, and other countries. 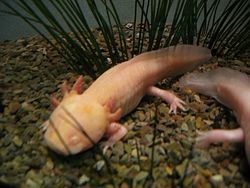 Axolotls should not be confused with waterdogs, the larval stage of the closely related tiger salamanders (Ambystoma tigrinum and Ambystoma mavortium), which is widespread in much of North America which also occasionally become neotenic. Nor are they to be confused mudpuppies (Necturus spp. ), fully aquatic salamanders that are unrelated to the axolotl but which bear a superficial resemblance. As salamanders (member of the amphibian order Caudata), axolotls lack scales and claws, have the presence of a tail in all larvae, juveniles, and adults, and have forelimbs and hindlimbs that are typically about the same size and set at right angles to the body (Larson et al. 2006). They have the characteristically slender bodies, short legs, long tails, and moist, smooth skin of salamanders. Salamanders generally have a biphasic life cycle, typified by an aquatic larval stage with external gills and a terrestrial adult form that utilizes lungs or breathes through moist skin (Larson et al. 2006). However, axolotls typically remain aquatic throughout life, not undergoing metamorphosis to a terrestrial adult but retaining their juvenile features. They can undergo transformation to the adult form under certain experimental and environmental conditions. Axolotls are members of the Ambystoma tigrinum (Tiger salamander)-complex, along with all other Mexican species of Ambystoma. Ambystoma, the mole salamanders, is a genus of salamanders endemic to North America. The genus has become famous due to the presence of axolotl, widely used in research, and the tiger salamander (Ambystoma tigrinum, Ambystoma mavortium). 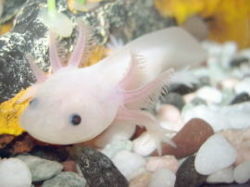 A sexually-mature adult axolotl, at age 18–24 months, ranges in length from 15–45 cm (6–18 inches), although a size close to 23 cm (9 inches) is most common and greater than 30 cm (12 inches) is rare. Their heads are wide, and their eyes are lidless. Their limbs are underdeveloped and possess long, thin digits. Males are identified by their swollen cloacas lined with papillae, while females are noticeable for their wider bodies full of eggs. Adult axolotls possess features typical of salamander larvae, including external gills and a caudal fin extending from behind the head to the vent. Three pairs of external gill stalks (rami) originate behind their heads and are used to move oxygenated water. The external gill rami are lined with filaments (fimbriae) to increase surface area for gas exchange. Four gill slits lined with gill rakers are hidden underneath the external gills. Axolotls have barely visible vestigial teeth, which would have developed during metamorphosis. The primary method of feeding is by suction, during which their rakers interlock to close the gill slits. External gills are used for respiration, although buccal pumping (gulping air from the surface) may also be used in order to provide oxygen to their lungs. Axolotls have four different colors, two commonly occurring colors and two mutants. The two naturally occurring colors are wildtype (varying shades of brown usually with spots) and melanoid (black). The two mutants colors are leucistic (pale pink with black eyes) and albino (golden, tan, or pale pink with pink eyes). The axolotl is only native to Lake Xochimilco and Lake Chalco in central Mexico. Unfortunately for the axolotl, Lake Chalco no longer exists, as it was drained by humans to avoid periodic flooding, and Lake Xochimilco remains a diminished glimpse of its former self, existing mainly as canals. The water temperature in Xochimilco rarely rises above 20°C (68°F), though it may fall to 6 or 7°C (43°F) in the winter, and perhaps lower. The wild population has been put under heavy pressure by the growth of Mexico City. Axolotls are also sold as food in Mexican markets, and were a staple in the Aztec diet. They are currently listed by CITES as an endangered species, and by IUCN as critically endangered in the wild, with a decreasing population. Their habitat is like that of most neotenic species—a high altitude body of water surrounded by a risky terrestrial environment. These conditions are thought to favor neoteny. However, a terrestrial population of Mexican tiger salamanders occupies and breeds in the Axolotl's habitat. Axolotls exhibit a property called neoteny, meaning the retention, by adults in a species, of traits previously seen only in juveniles. That is, they reach sexual maturity without undergoing metamorphosis. Many species within the axolotl's genus are either entirely neotenic or have neotenic populations. In the axolotl, metamorphic failure is caused by a lack of thyroid stimulating hormone, which is used to induce the thyroid to produce thyroxine in transforming salamanders. Unlike some other neotenic salamanders (sirens and Necturus), axolotls can be induced to metamorphose by an injection of iodine (used in the production of thyroid hormones) or by shots of thyroxine hormone. Another method for inducing transformation, though one that is very rarely successful, involves removing an axolotl in good condition to a shallow tank in a vivarium and slowly reducing the water level so that the axolotl has difficulty submerging. It will then, over a period of weeks, slowly metamorphose into an adult salamander. During transformation, the air in the vivarium must remain moist, and the maturing axolotl sprayed with a fine mist of pure water. The odds of the animal being able to metamorphose via this method are extremely small, and most attempts at inducing metamorphosis lead to death. This is likely due to the strong genetic basis for neoteny in laboratory and pet axolotls, which means that few captive animals have the ability to metamorphose on their own. Spontaneous metamorphosis has been known to occur very rarely, but attempts to do so artificially are best left to trained scientists. Artificial metamorphosis also dramatically shortens the axolotl's lifespan, if they survive the process. A neotenic axolotl will live an average of 10–15 years (though an individual in Paris is credited with achieving 25 years), while a metamorphosed specimen will scarcely live past the age of five. The adult form resembles a terrestrial Mexican tiger salamander, but has several differences, such as longer toes, which support its status as a separate species. Six adult axolotls (including a leucistic specimen, pale pink with black eyes) were shipped from Mexico City to the "Jardin des Plantes" in Paris in 1863. Unaware of their neoteny, Auguste Duméril was surprised when, instead of the axolotl, he found in the vivarium a new species, similar to the salamander. This discovery was the starting point of research about neoteny. It is not certain that Mexican tiger salamanders were not included in the original shipment. The surviving neotenes are thought to be the ancestors of the majority of pet and laboratory axolotls in existence. Czech physiologist Vilem Laufberger used thyroid hormone injections to induce an axolotl to grow into a terrestrial adult salamander. The experiment was repeated by the Englishman Julian Huxley, who was unaware the experiment had already been done, using ground thyroid hormones. (Aldous Huxley's After Many a Summer was inspired by his brother's experiments with axolotls.) Since then, experiments have been done often with injections of iodine or various thyroid hormones used to induce metamorphosis. Today, the axolotl is still used in research as a model organism and large numbers are bred in captivity. Axolotls are especially easy to breed compared to other salamanders in their family, which are almost never captive bred due to the demands of terrestrial life. One attractive feature for research is the large and easily manipulated embryo, which allows viewing of the full development of a vertebrate. Axolotls are used in heart defect studies due to the presence of a mutant gene that causes heart failure in embryos. Since the embryos survive almost to hatching with no heart function, the defect is very observable. The presence of several color morphs has also been extensively studied. The feature of the salamander that attracts most attention is its healing ability: The axolotl does not heal by scarring and is capable of the regeneration of entire lost appendages in a period of months, and, in certain cases, more vital structures. Some have indeed been found restoring the less vital parts of their brains. They can also readily accept transplants from other individuals, including eyes and parts of the brain—restoring these alien organs to full functionality. In some cases, axolotls have been known to repair a damaged limb as well as regenerating an additional one, ending up with an extra appendage that makes them attractive to pet owners as a novelty. In metamorphosed individuals, however, the ability to regenerate is greatly diminished. The axolotl is, therefore, used as a model for the development of limbs in vertebrates. The axolotl is carnivorous, consuming small prey such as worms, insects, and small fish in the wild. In captivity, axolotls can be fed a variety of readily available foods, including trout and salmon pellets, frozen or live bloodworms, earthworms, and waxworms on occasion. Axolotls also enjoy beef liver and sometimes small prawns. Beef heart is sometimes recommended, but is not a good choice for the animal, as mammalian proteins are not readily digestible. Small juveniles can be fed with Daphnia or brine shrimp until old enough for the larger foodstuffs. Axolotls locate food by smell, and will "snap" at any potential meal, sucking the food into their stomachs with vacuum force. This is why other animals may not be housed with axolotls (excluding adults with adults) as anything smaller will invariably end up in their mouths—even siblings. Fish can also nibble an axolotl's gill stalks and appendages while it is asleep, leading to infection. Darras, V. M., and E. R. Kühn. 1984. Difference of the in vivo responsiveness to thyrotropin stimulation between the neotenic and metamorphosed axolotl, Ambystoma mexicanum: Failure of prolactin to block the thyrotropin-induced thyroxine release. Gen. Comp. Endocrinol. 56: 321-325. Jacobs G. F. M., R. P. A. Michielsen, and E. R. Kühn. 1988. Thyroxine and triiodothyronine in plasma and thyroids of the neotenic and metamorphosed axolotl Ambystoma mexicanum: Influence of TRH injections. Gen. Comp. Endocrinol. 70 : 145-151. Larson, A., D. Wake, and T. Devitt, Tom. 2006. Caudata: Salamanders. Version 05. The Tree of Life Web Project. Retrieved March 30, 2007. This page was last modified on 14 April 2011, at 19:23.